Kicking off my 8 week study of heretics, entitled “Hooray for Heresy” with Joan Waste. Joan (1534-1556) was a protestant living under Queen Mary I’s Catholic claw. She was blind from birth and had a twin brother. By the age of 12, Joan had learned to knit and how to make rope, but unfortunately, it was by rope in which she perished. 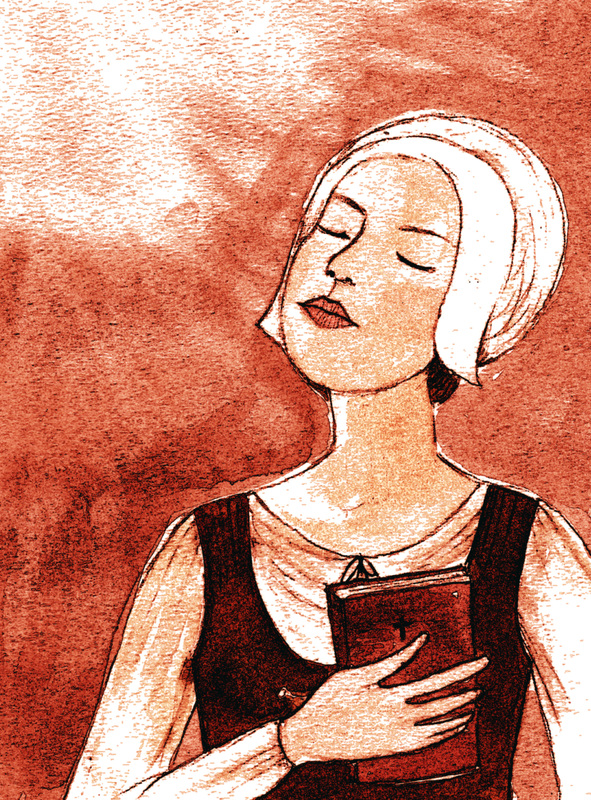 Joan was brought to trial for purchasing a New Testament which she asked friends to read to her and for refusing to give up her Protestant views. She was executed for heresy at Windmill Pit in Derby- hung by rope over a fire, she died when she fell into the pit of fire when the rope burned through. The court ruled she should suffer for her beliefs for all eternity. I hope she haunted those men until the day they died and even after that. There is a memorial for her in Birchover church in Derbyshire, England.